Devil’s Lake was pretty cool, let us know when you want to go! 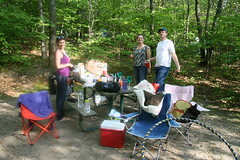 I did a Google search for this campground and your blog popped up. Nice write-up! Question: How long was the hike back to the walk-in site? Was your walk steep? I’d love a private site like this, but my companion may not.